Marin residents age 60 and older and those working with older adults are encouraged to take the Age-Friendly County Marin survey. I took the survey myself and question 4 allowed me to indicate that I live on a floating home. As FHA emergency services chair Flo Hoylman points out, “Our needs won’t be addressed if we don’t respond and identify ourselves as a distinct community.” So, if you take the survey, please answer as shown below. The survey will close on February 15. Results will help to inform development of a strategic plan to make Marin more livable for people of all ages. In September 2018, the County was accepted into the World Health Organization (WHO) and AARP Global Network of Age-Friendly Cities and Communities. That worldwide network is striving to better meet the needs of the growing population of older residents. As a member of the WHO and AARP Global Network, the County is making a five-year commitment to assess the age friendliness of County departments and unincorporated areas and create and implement a strategic age-friendly plan. 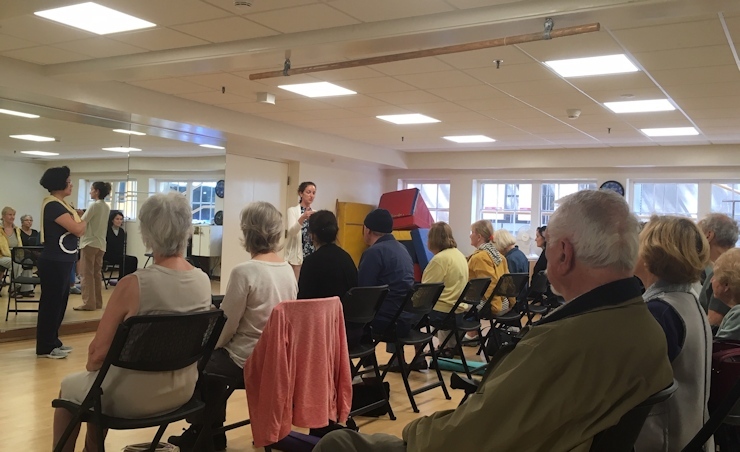 The survey also asks about the availability of services for seniors, such as a recent Sausalito Village workshop on Fall Prevention—the number one reason that Emergency Responders are called for seniors.